Drones are a powerful weapon in the fight against terror. 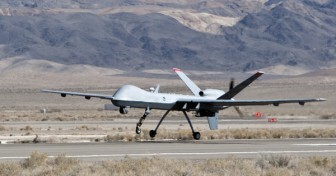 American drones have killed terrorist leaders and devastated al Qaeda. The Obama government argued that their lethal precision keeps civilian casualties to a minimum, that they are cheaper than fighter jets and, crucially, they minimise the risk to US troops. That’s why the US public supports their use. It’s also why President Obama oversaw a dramatic expansion in drone strikes, which is likely to continue under his successor, Donald Trump. In this programme, which aired shortly before Donald Trump took office, Vin Ray examines how drones are fundamentally changing the face of warfare – and what legal, ethical and psychological issues they bring in their wake. A growing number of critics fear we are entering an ever-growing spiral of drone warfare. They say the strikes are radicalising more people than they are killing and point to the proliferation of drones, with some 89 countries now possessing them and terror groups like ISIS experimenting with their use. So what happens when everyone has drones? It’s also argued that these strikes have been carried out with minimal oversight, guided by a policy that is largely secret and killing more civilians than acknowledged: that the strikes are illegal and unethical. And then there is the effect on the pilots sitting in their trailers thousands of miles away: PTSD and exhaustion are being blamed for a recruitment crisis, while many former pilots complain that this is a cowardly war.